DOWNLOAD FREE CHAPTERS BEFORE BUY THIS EBOOK. Are you tired of site rankings that place your web page on page number 5, 6, or 10 on Google and other search engines? You and I both know that in order to get serious amounts of traffic to your site, youve got to rank higher. If youre interested in making your website rank higher than ever, so you can drive free, targeted traffic to your website, then this will be the most important letter you ever read. It really is possible to get high rankings for your web site, without spending lots of money if you use the right methods. * Youre interested in learning search engine optimization techniques that work. * Youre interested in knowing the same strategies used by professional SEO firms. * You would like to create a literal flood of traffic to your web site. * You want to earn a real income online, instead of a few hundred dollars each month. * You are considering working with a search engine optimization or search engine marketing firm and want to have a basic understanding of what theyre doing so you dont get over-charged and under-served! Whether your web site has been online for just a few weeks, or for years, youve probably already discovered an important fact: search engines are key to visitors finding your site. Theyre the method of choice for finding web sites, whether someone is brand new to the Internet, or is a sophisticated web researcher. Young and old, new to the web, or highly experienced, we all use search engines and hunt through those first 10 or 20 results for the answers to our search. iProspect discovered during its Search Engine Branding Survey that more than half of those doing online searches (56.6) abandon their search after the first two pages of results. Only 23 of searchers ever look past the first two pages, and the numbers drop off significantly with each page. How does your site rank? Is it in those all-important top 10 results? Can people even find your web site online? The answer to these questions is vital, because if they cant find you, they cant buy from you. Its that simple. And search engines are how customers find you online. This is why search engine optimization (SEO) is one of the biggest buzzwords on the Internet, and why firms that specialize in it can charge thousands of dollars. You may have thought that getting excellent rankings is impossible for the little guy who doesnt have deep pockets to spend. You may have decided instead to try paid advertising (banners, ezine ads, or pay-per-click programs) to make your site more visible. This method does work (for awhile) and weve all tried it, including me. But why keep paying over and over for traffic when you can pay once to turn the tap - and then sit back and watch your site pull in traffic like crazy - and for free? But the fact is, paid advertising doesnt work in the long run. It only works as long as you keep pouring money into your campaigns. Its expensive. And it isnt the best method for getting your site seen by an online audience. Theres A Better Way...It involves Learning And Using Search Engine Optimization and Search Engine Marketing Methods Proven To Work! If you want your site to stand out online, you need to get into the coveted top ten on the major search engines. This can be done, if you know the methods that professionals use to optimize web sites. Your site can rank at the top of the pack if you apply the methods youll learn in this program, Search Engines Revealed. This course shows you how to get your site ranked highly, with methods that the pros have used over and over again. These strategies will result in a literal stampede of traffic to your site where people can buy your products and services. In Search Engines Revealed youll learn real insider secrets and methods to achieve top search engine rankings, the types that top SEO firms use to bring highly targeted traffic to web sites. Youll have the benefit of this type of information in a highly readable format that you can refer to over and over again. This step-by-step search engines course includes everything you need to know (with no technical mumbo-jumbo) to give you a serious edge in your sites search engine optimization. How to analyze your site listing the way search engines do-free! Methods your top competitors use to get their rankings and how to use them yourself! Two things your customers are looking for when they use search engines and how to make sure your site has them! Choosing memorable domain names that search engines love! This ebook is a complete manual for helping your site rise in rankings on the search engines. A manual that anyone, from beginner to experienced pro can use and benefit from. Because it puts them out of business! I personally think people cant know too much, or ever learn more than they need to, about a topic that is literally life or death for a web site on the Internet today. This is why, in Search Engines Revealed youll find information that those outside of SEO circles normally dont discuss, because they consider them trade secrets. * The real truth about cloaking, and why some firms use it, while others dont. * Things the Search Engine Submission guidelines dont tell you but you need to know. * Five reasons web sites get ranking penalties and how to avoid them. * Site architecture that ensures better rankings automatically. * Stemming and how it can be used to help give your site a leg up. * Keyword choices and methods that search engine optimization firms use. * How meta robot tags can prevent your site from losing rankings. Link popularity is also a major factor in getting your site ranked on the major search engines, including Google. Youll learn the secrets of how the most popular sites get links. How to analyze your sites link popularity: tricks that the pros use, that dont cost you a penny! Keywords: Key To Getting Your Web Site Found Online! When search engines index sites, they take a snapshot of it and store it in a huge database. When someone taps a word or phrase into a search engine, it searches through its indexed pages for ones that contain these same words or phrases. Youll learn how to use this fact to your advantage, and make sure that your site is one of the first ones that comes up during a search. Simply put, keyword phrases can make or break your site online. Used incorrectly, even excellent sites wont get found. Used correctly, your site will rise to higher rankings and a stampede of traffic will result. The problem is that most people dont know how to identify the best ones, or use them to best advantage. But after reading this ebook, you will. Often Teach That Could Get Your Site Banned. There are many (unethical or outdated) companies and people who teach optimization tricks that are actually passing along bad information. Information that can get you banned from the major search engines, if you use their methods. And once a site is banned, it can take up to six months to a year, or even longer, to get it ranked once again. Youll see how to avoid these problems in Search Engines Revealed. Youll have a search engine optimization manual in your hands that can help you get your site to rise in the rankings legitimately and stay there. Nothing is left out. This is a full course in search engine optimization that can be read and understood by complete beginners, yet is filled with insider tips that even experienced marketers will benefit from. Youll even learn the details of paid inclusion and Pay Per Click (PPC) advertising, and how to use them to their best advantage. Youll learn insider tricks and information that normally takes marketers years to learn; methods that let them get the maximum from their advertising dollars. Learn how Googles adwords and Adsense (contextual advertising) work, and how they can help even those on a tight budget get online visibility-fast!. Read about proven methods that will fast track your site to rapid acceptance on search engines-often within days! This ebook isnt just a little bit of information, here and there. 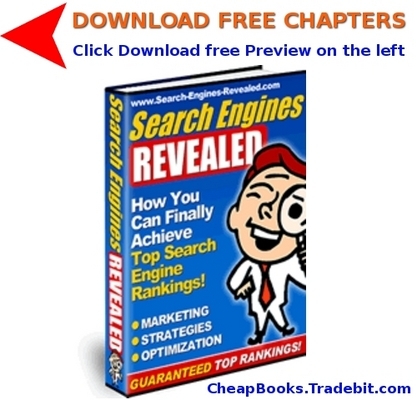 Its everything you need to know about search engine optimization, laid out for you in this comprehensive volume. You get tons of techniques and insider tips on how to optimize your site - and create a traffic stampede to your web site.